Hence this particular kettle dates to the late 1930's / early 1940's. Iconic shape from the deco era, circa 1925-late 30s. Stylish, heavy, needs a polish up. Sadly no lead. 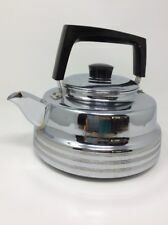 No returns Art Deco Electric Kettle. Condition is Used. Dispatched with Royal Mail 2nd Class. BOTTOM OF KETTLE: ROSTFREI, 18/10, FISSLER, STAINLESS, MADE IN BELGIUM. Scarce kettle by Rever Ware with copper bottom and stainless top. Nice art deco styling with bright red accents and cane wrapped handle. I'd rate it 8 out of 10. The cane looks great. Art Deco style. Classic Deco styling. circa 1950s. .
Patent No. 450427 - Circa 1930s. Its handle is made with Bakelite and so as the bottom base. With ceramic liner and Bakelite handle and bottom base. from spout to handle, 6" tall from knob top to bottom, 3.2" across the rim and 4.8" across the bottom. Here we have a stunning art deco copper kettle. This would look fabulous as a centrepiece on a table, hanging up in a country/farmhouse kitchen or placed by the fire. I use new & recycled materials to ensure that your item arrives to you safely. Nice flat top for warming your patisserie while the kettle boils. The handle, top and sides are all stainless steel. Rare OLIVER HEMMING NIO Ball TEAPOT KETTLE 18/10 Polished Stainless Stee. Oliver Hemming "NIO" Award Winning British Design and made with passion. He won the Johnson Mathey Silver Award for a silver teapot.". AUSTRALIAN POTTERY ART DECO BLUE SPECKLED - MOTTLED GLAZE SPEEDIE ELECTRIC JUG PORCELAIN KETTLE. SEE PHOTOS FOR GUIDE. TEAPOT WHITE PORCELAIN. LID IS ATTACHED TO THE COVER. WHEN COVER IS LIFTED LID OF THE TEAPOT IS REMOVED. WHITE BAKELITE KNOB. The item seen in the images is the item being sold as found. The pot has had no restorations to to it the ot is very nice and is well seasoned. Maker is Protherm, 220 volt. Nice condition. When it was new, it was marketed as a coffee server. This coffee server/ tea pot is used, but in excellent shape. Very clean on the inside. The outside has a few minor scratches and minor light water stains from light use. Looks like it's brass plated. See pictures for condition. Made in India. AUSTRALIAN POTTERY ART DECO GREEN SPECKLED - MOTTLED GLAZE HECLA ELECTRIC JUG PORCELAIN KETTLE. SEE PHOTOS FOR GUIDE. AUSTRALIAN POTTERY ART DECO BROWN SPECKLED - MOTTLED GLAZE SUNSHINE ELECTRIC JUG PORCELAIN KETTLE. SEE PHOTOS FOR GUIDE. SMALL NICK TO RIM OF SPOUT.